Sushi Sushi general manager Gavan Meadows. South Australian sushi lovers will be celebrating the news that Australia’s largest sushi franchise, Sushi Sushi, has arrived in the southern state. The company’s first SA store opened late last month in the New Royal Adelaide Hospital, which Gavan Meadows, general manager of franchise sales and marketing, said was a strategic decision. “The alignment with a prominent healthcare facility helps to reinforce our position as a high quality, healthy and fresh convenience food,” he said. 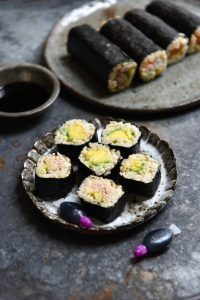 “Unfortunately, there are many on-the-go foods—including other sushi providers—that are far from healthy and fall short on freshness and quality, and we are committed to filling that gap. Sushi Sushi’s second SA store will open in Adelaide’s City Cross Arcade this month with plans to open up to 12 restaurants throughout the state in the next two to three years. According to the business, this will bring both franchise and employment opportunities to the Adelaide market. “Our South Australian focus is simply a response to consumer demand as we know local residents have developed an increasing appetite for high quality, yet convenient Japanese cuisine,” said Meadows. The move down south follows a year of growth for Sushi Sushi, with new store openings across the country. The company started in 1998 and now has over 120 locations across Australia in the ACT, Queensland, Victoria, Western Australia, the Northern Territory and Tasmania.